**You may elect to return the Ultimate L, L III or Ultra Massage Chair in the original packaging within 7 days of receipt to us for a refund of the total purchase price less freight. You are responsible to pay the return freight with our carrier. Prior written return authorization is required. 7 day in-home trial only applies to brand new Ultimate L, L III, or Ultra Massage Chairs that we ship, not to customer pick-ups & not to chairs bought for resale purposes or any chairs sold at a discount from the published selling price on this website. 7 day in-home trial does not apply to a user not fitting in the chair or because of color. Any returned chair must be in good condition and working order with no damage and be complete in its original cartons and original packaging at the time of the return request. We cannot ship any chairs without the original cartons and packaging and therefore cannot accept any return without the original cartons and packaging. It is the sole responsibility of the customer to keep the original cartons and packaging. We require that you complete a 15 minute phone call with us while you are in front of the massage chair for proper understanding and training on how to use the chair. Failure to do this training by phone will void any return request. At the time of a return request, which must be within 7 days after receipt, we require receiving picture files via email of the chair assembled from all 4 sides as well as pictures of the original cartons and packaging and also at that time receive picture files via email of the chair properly packaged up in all the original cartons on a suitable pallet after which we will issue an RMA along with return BOL and return shipping labels. After receipt and inspection, we will issue a refund. Massagechairsforless.com warrants the Ultimate Massage Chairs to be free of defects in workmanship and materials under normal use & conditions FOR A PERIOD 10 YEARS ON THE FRAME/STRUCTURE FROM THE DATE OF ORIGINAL PURCHASE & 1 YEAR ON PARTS AS PART OF THE STANDARD WARRANTY OR IF PURCHASED THE EXTENDED WARRANTY CAN INCLUDE UP TO 5 YEARS ON PARTS & 1 YEAR OF IN HOME LABOR. THE WARRANTY YOU HAVE CHOSEN IS INDICATED ON YOUR ORDER ACKNOWLEDMENT. Massagechairsforless.com is the exclusive factory authorized sales representative in both the U.S. & Canada. In-home labor warranty does not cover maintenance items, such as replacing a fuse, lubricating the chair, or replacement of an appearance item or fabric liner, etc. Massagechairsforless.com is liable to send the needed replacement parts under warranty. The frame has a 10 year warranty against defects. Appearance items & fabric liners are covered against defects when delivered. Damaged through improper usage, negligence, misuse, abuse, transportation damage, acts of nature, or accident (including failure to follow the instructions supplied with the Product). Leaving the chair's power switch on 24/7 is considered abuse. This warranty is extended only to the original purchaser and terminated upon transfer of ownership. This warranty shall not apply to any claims arising from the misuse, neglect, accident, abuse, improper installation, including but not limited to exposure to fire or to excessive heat, and other hazards of nature. Under any circumstances the seller will not be responsible for any injury to any person. This product is not intended to cure any physical problem of any nature. If a problem occurs, the buyer must e-mail Massagechairsforless.com with information and the nature of the problem, and to obtain technical support or inspection instructions. The buyer must include in the e-mail the original purchaser's name, date of purchase, original shipping address, daytime telephone number, chair model & serial number and a detailed description of the problem with pictures and or video. The buyer agrees to return at their expense defective parts that are replaced under warranty promptly. If parts are not returned within 2 weeks by the buyer, then we have the right to charge the buyer for them. In the event the buyer either has an overdue outstanding unpaid balance or has refused to return the parts to us, we have the right to refuse warranty service until this matter is resolved. In the event we decide to replace a chair, it must first be paid for and after receiving back the original chair complete in the original packaging in good condition & as agreed, we will issue credit back for it to the credit card used, unless there was a significant misrepresentation on the part of the buyer regarding the condition and ability to repair the chair's problem, such as insisting that a chair cannot be repaired, when in fact it can easily be serviced and did not require being replaced, or if the buyer agreed to do something as an inducement for us to agree to the replacement chair but the buyer failed to do what they agreed to do. We are not responsible for any misdiagnosis by a technician or us. THIS LIMITED WARRANTY IS AVAILABLE ONLY TO THE ORIGINAL PURCHASER OF THE PRODUCT AND IS VALID WORLDWIDE. MASSAGECHAIRSFORLESS.COM'S LIABILITY IS LIMITED TO THE PROVISIONS OF THE REPLACEMENT PARTS, AND SHALL NOT INCLUDE ANY LIABILITY INDIRECT, INCIDENTAL OR CONSEQUENTIAL DAMAGES OF ANY KIND. THE SELLER'S LIABILITY IS LIMITED TO MAKING ITS BEST EFFORTS TO PROVIDE THE REPLACEMENT PARTS AND SHALL NOT INCLUDE ANY LIABILITY INDIRECT, INCIDENTAL OR CONSEQUENTIAL DAMAGES OF ANY KIND. THIS WARRANTY IS EXPRESSLY MADE IN LIEU OF ALL OTHER WARRANTIES, EXPRESSED OR IMPLIED. Q-How are we able to offer such a fine massage chair at such a huge savings? A- We bring our massage chairs into the Port of LA, CA by ship in containers directly from the factory & distribute by truck throughout North America from our warehouse. We order them directly from the factory that makes them as their exclusive agents in North America, with no middleman markups & sell them directly to you, eliminating added handling costs. You in turn are handsomely rewarded with your savings of $3,000.00-5,000.00 off of the retail purchase price. You end up with the best massage chair possible at the lowest price anywhere! That coupled with excellent customer service is our recipe for assuring you of a pleasant buying experience & your becoming a happy satisfied customer. Q-Why do you charge for shipping when other companies offer free shipping? A- We are strictly wholesale factory direct. There is no freight company that will ship a rock, let alone a chair weighing 450 lbs. for free. Any company offering free shipping is a reseller and has buried the cost of shipping into the price. If we were selling the chair for $5,000.00+ we could easily offer free shipping and more. Q- How come you do not offer leather covering on your chair? A- Leather is the wrong covering for any massage chair for 2 reasons. One is that leather is a porous hide and if you sweat or spill a drink on it, it will be absorbed into the leather and it will smell and deteriorate. Second reason is that leather and heat do not mix. Heat will dry up and cause the leather to crack. We use the strongest high grade industrial strength pu (polyurethane), which looks and feels like leather, but is much more durable and is non porous. If you sweat on it or spill a drink on it, it will not be absorbed, but rather it will bead up on top of it and can be wiped off with a piece of paper towel. Secondly, it is also unaffected by heat. Q- How do I clean the pu covering? A- Cleaning the pu covering is a breeze. You never use any type of chemicals on it, just luke warm water on a piece of paper towel and most anything will easily wipe right off. 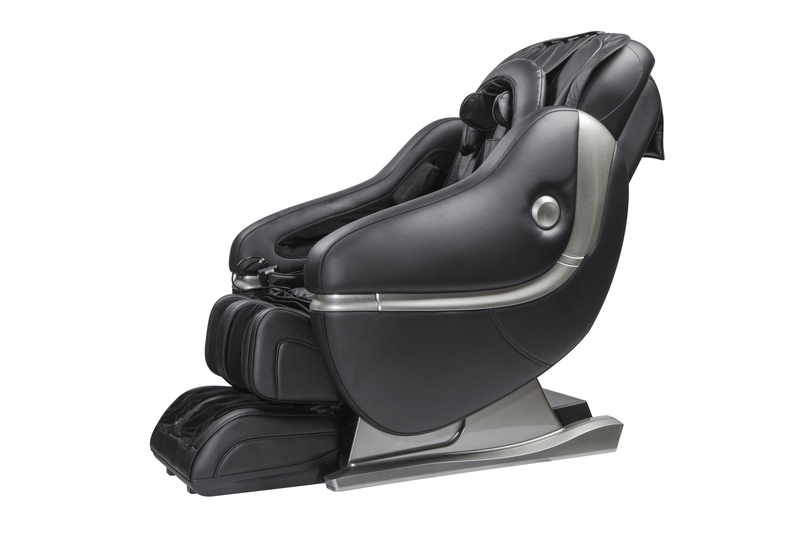 Q- Why don't you use plastic molded panels on the outside of the Ultimate L Massage Chair? A- Plastic molded side panels detract from the chair's appearance and make it look like it belongs in a kid's game room rather than a great room, family room or living room. They also scratch easily. But most importantly they squeak and creak causing the chair to be a great deal noisier. We use a steel frame covered throughout the exterior side panels with pu covering. It is much richer in appearance and it looks much better in a great room, family room or living room. It is more durable and most importantly our chair is much quieter, nearly whisper quiet. 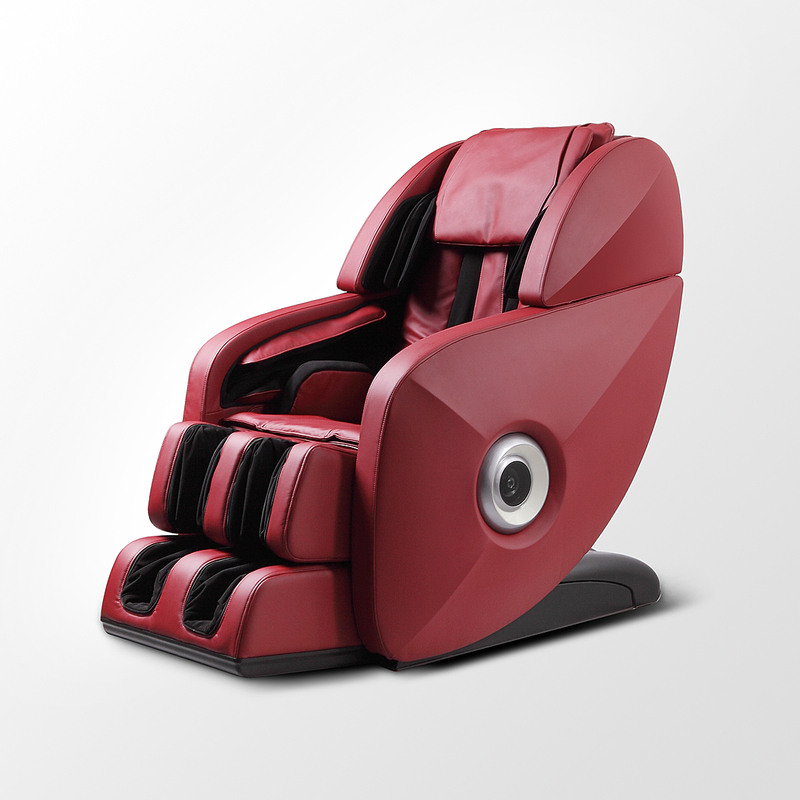 Q- What type of results can we hope to see using the Ultimate L Massage Chair? A- Customers are seeing less aches and pains of muscles and joints, improved circulation, improved mobility, and reduced inflammation in their bodies, as well as a new improved version of themselves and have regained their smiles back. You will also stand a greater likelihood of preventing the onset of a new illness by using the massage chair and also stand a greater likelihood of preventing an existing illness from progressing and in some cases we have seen certain illnesses put in remission. All illnesses begin as inflammation in our bodies. The massage chair will help identify and eliminate inflammation naturally at its source. It is not a cover up or a pain killer. It flushes away the inflammation using our bodies natural sewer system, our lymphatic system, which is designed to eliminate any toxins and things our bodies do not want need or use. We believe it to be the single best investment one can make towards improved health. Q- Will the Ultimate L Massage Chair hold up over time and if I ever need service how it is handled? A- Our chair is built with the highest quality commercial grade components and is designed to provide many years of uninterrupted performance. We have chairs in chiropractors, massage therapists, physical therapists, Veteran's hospitals, car dealers, teachers associations, etc. many of whom use our chair for as much as 16 hours a day. No other chair can handle that. It is also the only chair that can give a 1 hr. or longer massage. It weighs about 100 lbs. more than an average massage chair and is better built. It is the only massage chair that is tested at the factory before they are shipped. We also have the lowest incidence of service of any chair in the industry. We are like the lonely Maytag repairman of massage chairs. There also is no maintenance on our massage chair. The only time you service it is if you have a problem. You are less likely to ever encounter a problem with our chair, however; if you do, you can reach us 7 days a week from 10:00 A.M. - 11:00 P.M. EST by phone and 24/7 by email. We stock all the parts. The chair is modular in design and you can replace most any component in under 15 minutes with no mechanical ability needed. If a part is needed to be replaced, we will send it along with a step by step on how to replace it. If required we have technicians available as well. 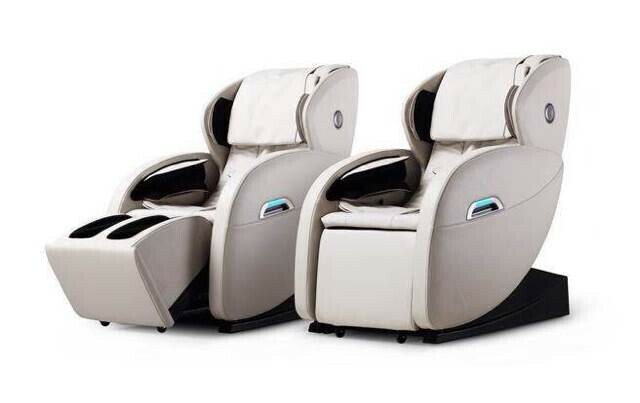 Q- Is there a place where I can try the Ultimate L Massage Chair? A- Since we are factory direct, if we were to have retail locations the prices would be much higher. We do have many satisfied customers in surrounding areas that you are welcome to talk to. Some have extended the opportunity to see it and try it in the past, but that is not something we can do. Even if we did have a retail location near you it still would not be the proper way to evaluate any massage chair for the following reasons. Firstly, you are likely not dressed properly to enjoy the full benefits of the massage chair. To do so one would be dressed in only shorts and a Tee shirt. Anything beyond that, long pants, layers of clothing, etc. will detract from the massage. Secondly, you cannot begin to understand or experience all of what the Ultimate L Massage Chair chair can do in 1 hr., which is why we provide you the best solution, our in home 7 day 100% risk free trial. You are given 7 days from the time you receive the chair to make certain you are delighted. If not you contact us and let us know and as per our terms we arrange to pick it up and refund you in full for the original purchase price less shipping. No one else in our industry provides this. The reason we do this is because we know that you will be delighted. If our Ultimate L Massage Chair doesn't delight you in every way a massage chair was intended to do, then no chair in the world would. Terms & Conditions - Any order that is placed either online or by telephone has accepted & agreed to all of our terms whether or not they acknowledge it in writing. All orders are prepaid. Items in stock are typically shipped within 2 days of receipt of order & will be delivered within 1 week, unless otherwise specified. Not responsible for delays caused by things out of our control such as weather delays, labor contract delays, port congestion, etc. Orders canceled for any reason are subject to a cancellation fee of 20%. Any order that is shipped by common carrier and refused or canceled after it is shipped or for any return that is approved in writing except for the 7 day in-home 100% risk free trial, is subject to a restocking fee of 20% + the shipping costs both ways. Any order that is canceled and then reinstated does not qualify for the 7 day in home trial. If you decide to change colors after receipt of your massage chair and it was not our mistake, we will gladly accommodate; however, it is subject to the shipping costs. All parts purchased are nonrefundable. Title and ownership remains with the seller until any outstanding balance is paid in full. Buyer agrees to be bound by the laws of the state of NH for any disagreements & agrees that any legal action will be brought in NH. Buyer agrees to submit to NH legal jurisdiction and be subject to treble damages for any legal action for any chair, part, or service ordered, delivered and received and not paid for any reason and to pay all of our legal fees & or collection fees. We reserve the right to deny any chair, part or service for any account with an outstanding balance. Any payments received for any purchase not completed by the buyer for any reason whatsoever after 3 days will not be refunded. Buyer agrees to not slander or libel or defame us or attempt to discredit us or to damage our reputation in any way or to make false statements about us and to be totally responsible for any and all damages arising out of any malicious acts including any & all legal remedies available as well as all legal fees. Specifications, prices, terms and conditions are subject to change without notice.